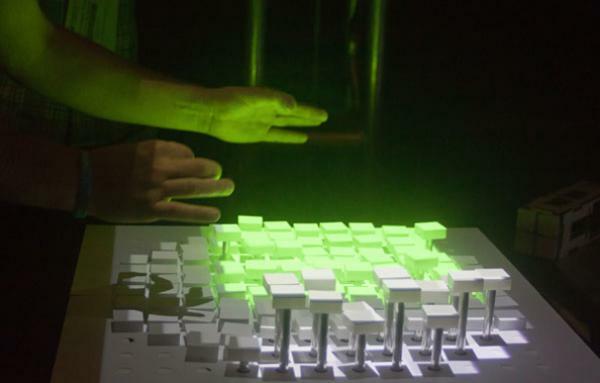 Recompose, the "digital clay" 3D interface developed by MIT Media Lab. Courtesy TechNewsDaily. Digital Clay. Last week at the SIGGRAPH technology conference, a prototype input device called “Recompose” made its debut. TechNewsDaily says that this “marriage of a keyboard and a 3-D tiled surface could be the future of computer interfaces.” Developed by the MIT Media Lab, Recompose will give users the ability to “sculpt” data. LED Lettuce. The Dutch have amped up hydroponic agriculture with the use of LEDs, notes Good magazine. Scientists in the Netherlands have found that using the red and blue versions of the lights maximizes the effects of sunlight and minimizes dehydration. A bonus result? Greenhouses with rave-like ambiance. Flat out Platonic. Core 77 alerted us to the thought-provoking carpet designs of Luís Porém, which are based on deconstructed Plato’s beloved polyhedrons. Biker Rights. A group of NYC lawyers ride to the aid of cyclists disputing NYPD tickets for bell, helmet, and lane violations, reports The New York Times. The law firm of Rankin & Taylor is preparing a class action suit against the city on behalf of bikers.